Is there a way to create a sort of list that contains buttons (and other elements) with a vertical scroll bar?Not text only! How to build horizontal and vertical scrollbar with elements inside (buttons, checkboxes…)? I’d check out the vLib demo, specifically vTable. That’s the best “workaround” available afaik. Thanks, I’ll take a look, again.I would like to see the concrete and simple code.Maybe that solution is like a patch?An invention?I think that Danoise has made several tools using it. I’d guess that the code is clearly readable and well laid out. Most likely object oriented in some fashion, and perhaps you can/should even use the vTable straight out (with some minor modifications?). Of course you will have to implement the solution yourself, depending on your needs. I really do not like this solution (vTable.lua)https://github.com/renoise/xrnx/blob/master/Tools/com.renoise.vLib.xrnx/vLib/classes/vTable.lua.It seems that the API available to create the tools does not have a concrete solution to solve this. multiline_text and multiline_textfield (elements with scrollbar) only serve to text, not to include other elements inside.I believe. 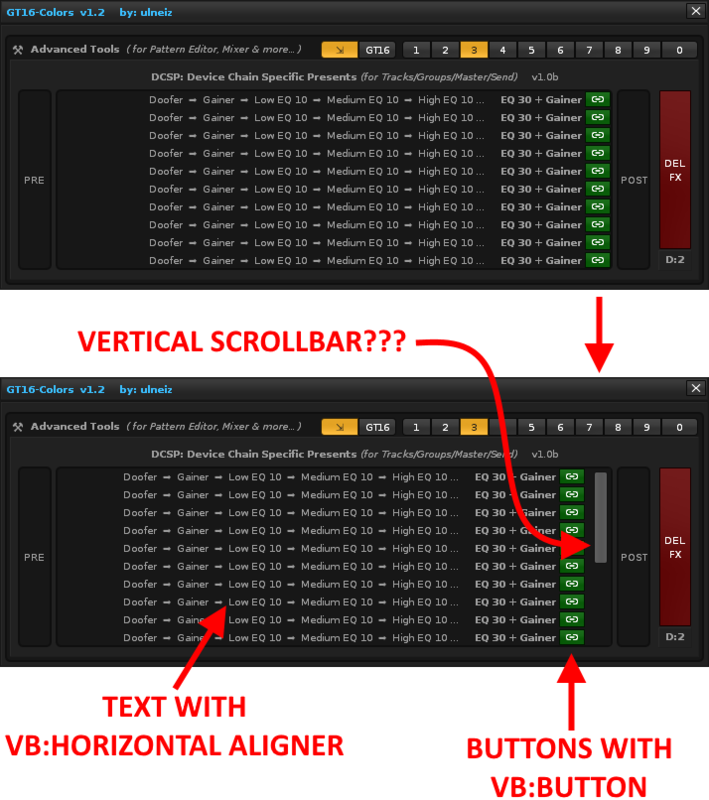 Yes, indeed this is the best solution to a scrollbar available at the moment (as far as I know). vLib comes with a demo, in a very similar fashion to the viewbuilder “Example tool GUI” - both great places to start learn and experiment. HTML docs are also included. My approach would be to use the vScrollbar class. It seems it will -> output some kind of step value -> that you can use to refresh an area -> that displays an offset list with N number of elements. perhaps you can/should even use the vTable straight out (with some minor modifications?). Of course you will have to implement the solution yourself, depending on your needs. Even if the vLib comes with examples for the various GUI widgets, they only come with a_single_example. And a thing like the vTable actually has many possible configurations (for example, it’s powering my disk browser widget too…). What I’m saying is, the vTable is one of the most complex widgets but lacking a bit in the documentation department. So - Raul - I can offer you some code that creates a functional table for you, looking more or less like your screenshot? I do not know if it is possible, just show the bar, exactly the same as in the image. The idea is to insert many lines of text + button, about 30 or 40 or more. In the image only shows 10.And that the frame occupy approximately 6 lines in height. You should know that the cLib/vLib folders are the FULL libraries, they contain dozens of classes that are not even used in this simple demo. Just stick with the code for main.lua,vTableDemo_Prefs andvTableDemo_UI - this is the “implementation” of said libraries. @Danoise. Thank you for this! I do not know the whole history of the API Lua available to create tools since the birth of Renoise. A customizable checkbox.It would be a mix between a “button” and a “checkbox”.Accept text, and bitmap at the same time. This saves a lot of space. This, a area customizable with scrollbar (horizontal and vertical) capable of supporting any element intermixed(text, checkboxes, switches, buttons, popups, etc).This saves a lot of space and serves to organize great things. 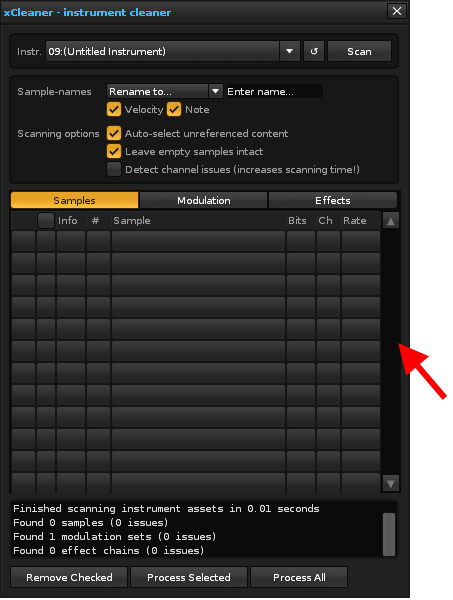 Fonts customizables.At least, take the default skin color of Renoise. Could Taktik can add these things?Or is the Lua API available a closed thing, untouchable? For example, you have repeatedly used your “personalized scrollbar” (I do not know what to call it.). It is a clear sign that it is necessary.Why not include an official with the exact style used in Renoise? I’m surprised by this. I will try to look at the demo in depth, but if it is too complicated or too loaded to add the scroll bar,I will have to use more switches. Yes, the APIs themselves are closed. Which is good, because if they changed too much then a lot of tools would constantly break. Even though the API has not seen many changes from 3.0 to 3.1, the transition from 2.7 > 2.8 > 3.0 required changes to many tools. For example, you have repeatedly used your “personalized scrollbar” (I do not know what to call it.). It is a clear sign that it is necessary. You don’t have to wait for Renoise to implement feature XYZ (assuming of course that the feature can be implemented with scripting). When/if the feature arrives, the vLib framework can replace it’s custom implementation with the native one. That’s usually the point with frameworks - that they abstract away the implementation details. I’m the one managing Renoise API suggestions, btw. Do you know of the API wishlist? Wow. I still think that if one thing can be improved, there is no need to look at third-party tools. They will fix, and not slow Renoise’s development.I do not care if my tool is going to break in the future. I’ll sort it out.However, some things may be included for being new, and therefore, they do not break anything previous, because they are new, never used before. I think vLIb, cLIb etc. is too advanced for most users, those who already understand enough of the code.The problem is not the code itself. It is read and can be studied. But rather its implementation in other tools.For example, a simple tool that weighs 40KB, would have to load more than half a MB of code libraries, in addition to adjusting the code of tool.Otherwise, it touches studying pieces and jumping from side to side to implement. However, they are a great help, you can find some very interesting solutions, and fix strange things that should not happen. For example, in my case, I look for specific functions, the minimum necessary to optimize the code, and not add unnecessary things.I guess all programmers write like this.Now I’m at a point where I write faster, and some things I know will work without having to try them out.Less trial and error. Is a valuebox for deploy a list.Another homemade invention. What do you think? Not much, I’ll take a deeper look when I have more time. Thanks! I hope that the suggestions in the API will also continue to be addressed…Every time I get depressed more. I can not stop reading user complaints in the forums.Let’s see if people are encouraged.